Members of the GCU landscaping crew have plenty of things to keep them busy grooming lawns and trimming shrubbery on the well-manicured campus. The new intramural field just east of North Gym won’t be one of them. 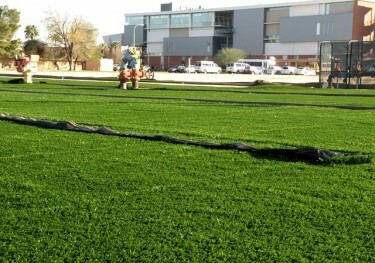 GCU is installing a synthetic turf called EasyTurf on the intramural field, giving the University a space big enough for two soccer fields that will always be ready to use. 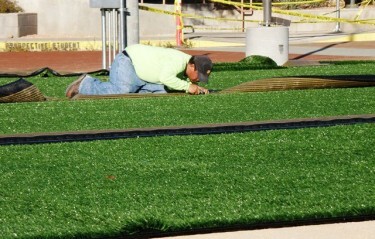 A worker from Sunburst Landscaping begins installing EasyTurf on the new intramural field east of North Gym. “Our soccer teams can also practice on it if they’re going to northern California or some place that uses FieldTurf,” Oesterle said. EasyTurf is manufactured by FieldTurf – the surface that is used in 22 of 32 NFL stadiums or practice facilities. Locally, FieldTurf was used for Arizona State University’s domed practice field and the football field for Brophy College Prep in Phoenix. EasyTurf is a two-inch polyethylene fiber with a net backing that provides better water drainage than natural grass and lasts 15-20 years, said Don Gabbard, president of Sunburst Landscaping, an authorized dealer of EasyTurf. The new intramural field featuring EasyTurf will be big enough for two soccer fields once the sand volleyball courts are relocated. Three-quarters of an inch of silica sand is added to the “grass” fibers, followed by another three-quarters of an inch of rubber granules made of re-ground athletic shoes and recycled tire material. This provides a “synthetic earth” base and acts as a cushion for the turf. For the intramural space at GCU, 75 tons of sand and 75 tons of rubber granules will be trucked in. “We’ll start the infill on Friday and hope to be done by next Friday,” Gabbard said. Oesterle emphasized that employees and students need to stay off the surface during the installation process because the turf seams are still being glued together. The sand volleyball courts will be moved in the next few months to the area near Brazell Stadium where the Pono Construction offices are now located. Pono’s offices will move to the northwestern corner of campus. There will be three volleyball courts once they are relocated, and they will be surrounded by a pavilion-type setting designed to be a destination spot for outdoor gatherings and picnics. Once that relocation occurs, the EasyTurf intramural field will be extended into the area where the volleyball courts are now located. A four-story classroom building adjacent to the College of Arts and Sciences building will break ground in August or September and be ready for the start of classes in 2014. The new classroom building will feature a bridge on the fourth floor that connects to the CAS building. Demolition of the buildings on North Campus is complete. GCU is expected to have the building permit for Saguaro Hall today and will break ground on that new dormitory on Monday. Saguaro will be located just north of another new residence hall, Chaparral, on North Campus. Construction has begun on the second floor of Chaparral. Both five-story dorms are expected to be ready for the start of classes in the fall. The building permit for the 130,000-square-foot office space on 27th Avenue also is expected today. Interior demolition of that former Indoor Swapmart building will begin next week. The transformation of the east-west roadway connecting the Promenade to North Gym is complete. The street, which previously was open to vehicle traffic, is now a pedestrian pathway of stamped decorative asphalt that resembles the brick Promenade. The north-south street in front of North Gym also is being converted to a stamped asphalt “brick” pathway and should be completed within the next couple weeks.